Yep! Our support is strongest for the GOG version, in fact. Over at Ironfist HQ, we�ve been working hard on a fairly�.explosive�.new creature. Still, we thought we�d share an early treat with you by releasing a new version of Ironfist! We�ve done various minor stability tweaks, fixed the infamous �Dancing Peasants� bug fixed a minor bug in Sorrow�s End, and made some additional improvements to The Last Stand, (courtesy of one of our fans, �The Unknown Hero�). All this adds up to one solid Ironfist 1.2.1 release. Enjoy! You�ve waited�.and now it�s here. The Cyborgs have been busy upgrading the various creatures they find in order to help defeat the evil warlocks. They captured the most powerful creatures they could control, and built them into their ultimate weapon. The Cyber Behemoths are augmented giants, subdued by magical means, and fitted with cranial implants. Their rocket boots give them a fearsome stomp, but their true power lies in the plasma cannon on the back. Twice per battle, they can fire an explosive charge, burning all enemies in a large radius. These Forge units still don't look like HMM2 style. Edited by NimoStar at 11:58, 07 Oct 2016. I would like to see them ingame with the other creatures before judging. But I don't tend to like light-blue balls of energy as attacks maybe do it like lava? the monster looks fiery but the energy ball looks frost. I liked the password write down feature, it made it different from the rest of heroes where border guards were too automated. Maybe you could take sprites from some older arcade games for the rest of creatures? There are thousands of them too choose from, and also sprites graphics enciclopedias with them. So that it doesn't look too "modern" compared to a mid-90's game. Edited by Darmani at 21:40, 12 Jul 2017. Subdued and controlled by magical means, the Cyber Behemoths are cyclopes that have been augmented with cranial implants and cybernetic attachments. With their plasma cannon on their back and their jump powered by rocket boots, the Cyber Behemoths form the ultimate menace in the Cyborg army. You have waited. And you have been rewarded. For today, we release our new version of Ironfist, and with it, the fearsome Cyber Behemoth. Their powerful 5�5 explosive attack can be the end of many an opponent�but be careful, for you only have two shots. Play it in our new map �Behemoth Path,� and see how one Cyber Behemoth, commanded by a lone knight with some strategic maneuvering, can take on overwhelming armies, and reclaim your family heirloom from the dragon hoard. Behold, Ironfist 1.3.0. Download it now. HoMM II was the first game ever to feature operatic vocals, and features an excellent score by famed video game composer Paul Romero. 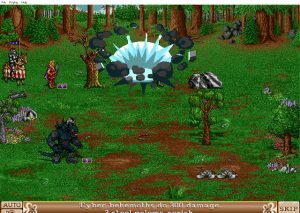 For many years, versions of HoMM II such as the GOG.com version could only play the choppy MIDI versions. Ironfist had been similar, until now. We are pleased to announce that Ironfist now has full support for CD music, and will work out of the box with CD music when installed on top of the GOG.com version. Oh, and did I mention there will be more music? We�ve recruited a very talented composer, and look forward to releasing some of his work. We�ve made some improvements to the Ironfist map editor, of which the most notable is the undo button. In the original Heroes II editor, you can only undo one step; now, in the Ironfist editor, you can undo many. Making a mistake is now much less of a big deal. We�ve also implemented a major overhaul of the scripting system. Adding your own abilities and quests is easier than ever thanks to new features such as callbacks, modules, and deep binding. Details of the overhaul are given here, and examples are given in the introduction to scripting. Ironfist is recruiting a new programmer. Do you want to turn your C++ skills into new features for one of the best PC strategy games ever? This role may be for you. We are also looking for players willing to volunteer as testers for our new maps. Contact homm2ironfist@gmail.com if interested in either position. From a significantly improved loading time and stability improvements, to lots of new scripting functions to use in your maps, we�ve made quite a few smaller changes to Ironfist. See the full list in the release notes. Though things have been quiet on the outside here at Ironfist HQ, on the inside, we�ve been busier than ever. New maps, creatures, and features are arriving like clockwork as the new Cyborg faction comes to fruition. Although this release just contains the first of the new Cyborg creatures, we have finished the artwork for all 6 of them, and are rapidly finishing the coding and sounds for the last few. There is more to come. We haven't talked about adding new heroes to existing factions. I don't see any barrier to doing so, however. Edited by avatar at 22:01, 13 Jul 2017. Can't launch ironfist.exe because bass.dll is missing I use gog version of H2 under win10. Avatar: Try turning on compatibility mode. Right click on the executable; select "Properties." Edited by LucPatenaude at 20:47, 15 Jul 2017. @ Darmani: Tried that, many times over. Still, more bass.dll errors came up. Do I need to downgrade the version of the Bass.dll back from 2.4.6 to 2.2.0 in order to make it work? For some reason, there is a small note beside it that it says that this downgrade of version was performed by the makers of such .dll file all the way back in 2013. Stopped development of such system 32's gaming file ever since. What would be the cause? Is Win. 10 using some kind of a totally different type of gaming file or, what gives? Ah, the not-so-fun part of working on legacy games like this. I replied to Luc by PM to give him some one-on-one support. I'll make the same offer to anyone else having trouble until we get all the install issues worked out. My goodness this is impressive! Good work fellas. Edited by rafter at 22:24, 17 Jul 2017. I found an archive of different versions of Project Ironfist. But only versions- 0.8.0 , 0.8.1 , 0.8.2 and 1.0.0 work on my PC. It will be good if players may choose in the menu with the map and the starting race, the options that the Project adds like Heroes 3 Wake of gods. There's only one major problem with this post of yours. Where's the links that proves your incredible finds. But only 0.8.0, 0.8.1 , 0.8.2 and 1.0.0 work on my PC. What happens when you try to run 1.2.1? Edited by Baronus at 20:35, 22 Jul 2017. For me "not correctly exe for 32bit system" on my old pc. I dont want you lost time preaparing to very old OS but Im interesting because I read that you tested wind xp and work? 64 only ? PM me with a screenshot.. Ironfist is very much a 32-bit game....that's a pretty weird message.